© Estate of Zoltan Sepeshy. Photograph by R. H. Hensleigh and Tim Thayer. During the Depression years, government and corporate patronage promoted public artworks designed to inspire civic pride, social unity and job productivity. Like many of his peers, Zoltan Sepeshy was commissioned by the Federal Art Project to create murals for government buildings, including post offices in Michigan and Illinois. 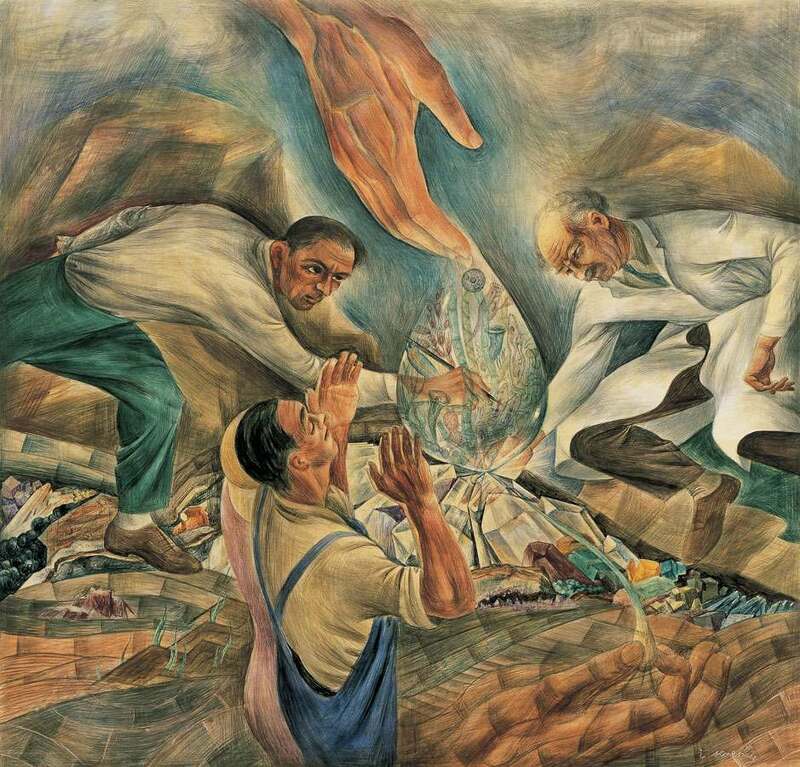 Among his most significant private commissions was a mural for the Rackham Engineering Foundation in Detroit. Destined as an over mantle decoration for the Engineers’ Lounge, Sepeshy conceived an image that celebrated nature as the inspiration for human endeavors. His design, The Scientist, Artist and Farmer, was elaborated in a detailed study, which includes the architectural elements of the ceiling, wood paneling and fireplace that would ultimately frame the panel in situ. It illustrates the massive hand of God bestowing the gift of water from above. In a single magnified drop, three men see this natural resource from the diverse viewpoints of scientific inquiry, creative expression and pragmatic application. Sepeshy cleverly represents himself as the artist whose outstretched brush appears to summon the vivid scene to life.